Your golf swing rhythm is defined as the beat of your swing. Everyone's golf swing rhythm and swing tempo will move at a different beat. Some swings may seem faster than other swings, just because they look fast doesn't mean they have a poor rhythm. 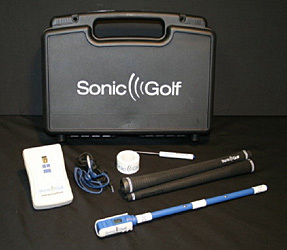 Your tempo is like the way you walk, if you walk fast you will more likely have a zippy golf swing. If you are slow and deliberate, you will have a slower and more deliberate swing. Your golf swing rhythm is defined as the beat of your swing. Your tempo is the acceleration and deceleration the club through your entire golf swing. Your rhythm and tempo are directly linked to a balanced swing. There is a consistent swing tempo that all professional golfers maintain whether they have a driver or a wedge in their hands. A rushed swing only leads to an imbalance, which only creates poor ball contact, in a trap or on the fairway. To strike the ball correctly one's balance must be maintained. Your swing rhythm permits you to correctly sequence your swing motions and impact the ball with the proper torque propelling the ball upward and outward. Don't confuse the speed of your golf swing with your rhythm. The tempo and rhythm are not the same as your swing speed. You must be efficient and be able to repeat a good strike at impact. A body must work in harmony to strike the ball as far as you can. When you hear someone tell you "you are swinging too fast", it isn't usually about your swing speed. What they are really telling you is that you have a sloppy and choppy swing, you have no tempo nor rhythm. You have no flow to your golf swing. When there is rhythm, there is balance and the symmetry necessary to execute a proper golf swing. Do not become intimidated and actually slow your swing speed, instead find that tempo that will bring your body back into alignment and your true swing speed will not need altering. I have often tried to sing or hum a little ditty while walking to my ball, I find tunes that are consistent with my own swing speed. This takes an awareness of what constitutes an individual's own swing speed for success. You set up, you are addressing the ball and you have a waggle. The first beat is at your last waggle, just before you take your club away into the back swing. You are now in that proverbial coil, just waiting to release all that potential energy, you are at your second beat. As you release the energy to strike the ball, you will hit it on the third beat, and follow through. There are three beats to a golf swing, set-swing-through-to a completed swing with belt buckle facing the target, we call it the pose. Do remember we are playing golf not hockey (although I do have a mean slap shot, for special occasions), we want the full impact of the follow through, which will give us that distance we desire. We want our shoulders and arms to be relaxed. Tenseness causes those short choppy swings. We want to have the natural flow of our golf swing, that is our own rhythm. We want to feel the free and effortless flow of our golf swing. We do not want to over swing and lose control of the club head. We should become aware and attain the feel of how our bodies move while swinging the golf club. It will help us in the long run if we spend time knowing our own body's movements. We want to become coordinated. We can thus develop that sense and feel for a rhythmic golf swing. This is an individual process. Each of us must find our own tempo, to make ourselves feel comfortable in our own golf swing. We will be able to incorporate this golf swing rhythm into our routine rather than just aimlessly having some motions in a practice swing and useless waggles. Too often a golfer is so concentrated on all the mechanics of a golf swing that there just isn't any way for them to develop the rhythm. Mechanics produce those demons that decide to debate themselves over what we could be doing better, or what we are doing wrong. Those debates should be done on the driving range or at our lessons, leave them in the golf bag at the first tee. There should be no competing thoughts in our head, which distract us from the free flow of our golf swing rhythm. It is as if we were at a rock concert in our minds, and only setting ourselves up for failure. Maintaining our concentration on our tempo, our three beats, can keep the debating society from becoming the loud distraction they can become. Here is a video I put together with my swing tempo and rhythm, using Tour Tempo's 27/9 technique. If you find this tempo to fit your swing-please bookmark, then you can listen to it at your leisure. 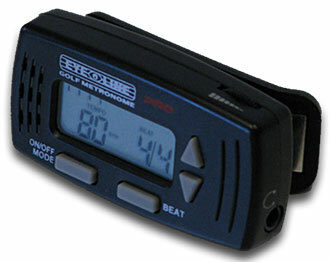 It can become a good training device to en-grain a tempo into your sub-conscious-before you purchase a tempo training aid.